Top Irish Business Women to address BPW Summer Lunch sponsored by FBD Insurance. Details of the ever popular BPW summer lunch were formerly launched this week and BPW are delighted to partner with main sponsors FBD Insurance this year in organizing a glamorous summer event on Friday 21st May at the Ardilaun Hotel – a definite date for your diary! The event will commence with a champagne reception at 12 noon followed by a sumptuous four course lunch – afterwards you can relax to some swinging jazz to end a perfect afternoon. 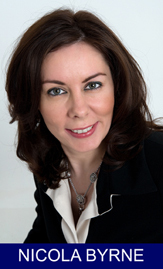 Leading Irish business woman Nicola Byrne will be the guest speaker at this year’s lunch, she is the Managing Director of 11890 which is Ireland's only native directory-enquiry company. Byrne spent her early career at a number of companies, ranging from Gateaux and Jacobs to Evian, Bank of Ireland and AC Nielsen. She then set up her first company, Stenix Media, selling advertising on tickets. Byrne subsequently spotted the opportunity for a new directory-enquiry service to challenge the incumbents and 11890 was born. It began as a corporate-only service and she signed up a range of top clients including KPMG, An Post and AIB. The idea was simple! Currently employing over 100 people – they receive 200,000 calls a day. Due to her entrepreneurial flair Nicola is listed at number 8 within the top business women in Ireland. BPW are happy to announce that ISPCC/Childline has been nominated as the charity that will receive funds generated by the raffle at the summer lunch. Founded in 1889 The Irish Society for the Prevention of Cruelty to Children (ISPCC)/Childline is one of Ireland’s oldest and most well-known children’s charities. The ISPCC has a long, proud history of service delivery and advocacy on behalf of children and the proceeds from the charity will go to fund activities in the local office in Galway. Speaking at the launch BPW Galway President Carmen Taheny said we are delighted that FBD Insurance has come on board this year as our main sponsor for this wonderful occasion. FBD are the 2nd largest Irish Insurance company in Ireland, coupled with great value insurance and genuine customer service, they are looking after more than half a million cars, homes and businesses this year. Whether you contact FBD online, over the phone or in their local Galway office you can be sure you will get a prompt response, excellent customer service and hassle free insurance solutions – what more could you ask for? Launching the summer lunch rumors circulated the room regarding a very special treat in store for the ladies attending on the day. Brown Thomas Galway have kindly come on board to offer some essential beauty and fashion tips during the day and they are also sponsoring a special prize for the most glamorous lady – so ladies get those matching accessories dusted down and remember to dress to impress as you join BPW Galway to kick off your summer social diary. Don’t delay in booking your tickets as each year the attendance numbers are growing for this hugely successful event. For further information and to purchase tickets at 50euro for this event contact Michelle Murphy on 086-2204082.